How to Activate Whats App Calling Feature For Android Or iOS Users. 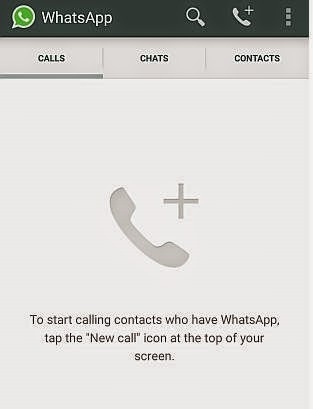 After deal with Facebook, WhatsApp Giving New Features.Now WhatsApp call functionality has finally been added to the instant messaging app. The new feature lets you make free WhatsApp voice calls.It is now available to all Android and Ios users. The world's most popular messaging app with over 700 million monthly active users only introduced this feature for Android and iOS users. Whatsapp an android application which is famous for its instant chat service now has become the top most rated app in the android Google market. If you are not an Android or iOS users, you'll just have to wait a little longer to get this feature. But if you use Android or Ios, and haven't yet activated voice calling on WhatsApp Now. First Download the latest version of WhatsApp for Android from here.Latest version on WhatsApp's website is 2.12.7, but if you are downloading from Play Store, ensure that your device has version 2.11.561. Older versions don't support this feature for all users. After Download the latest version of WhatsApp Now install on your Android phone, ask someone who has WhatsApp calling enabled to make a WhatsApp call to your number. If missed call doesn't work. You will have to receive the call and wait for a few seconds before disconnecting to activate WhatsApp voice calling. When the feature is enabled. Now you will see three-tab layout on WhatsApp, one each for Calls, Chats and Contacts. Note: For Ios User Feature Only Available on your 'jailbroken' iPhones and iPads, and cydia that software is not approved by Apple Inc. Install WhatsApp beta 2.12.0.1 on your iPhone. A simple Google search of WhatsApp beta 2.12.0.1 will do, or you could download and install it on your device from the WhatsApp.net site. Add iMokholes repository to your list oif Cydia sources. After installing the WhatsApp beta version on your device, launch Cydia and add this repo to the Cydia sources. Enable WhatsAppCallEnabler from Setting. Once you’ve added the iMokholes repo, install WhatsAppCallEnabler from the settings of the application. Receive a call from an ‘enabled’ WhatsApp contact. Launch WhatsApp and ask a friend who has the Voice Calling feature activated to call you. Once you receive that call (the person doesn’t need to be on your contacts list), WhatsApp calling will be activated on your iPhone. Disclaimer:Gettrickz.com does not recommend 'jailbreaking' your devices. THank you for sharing great information i love it, book Taxi in Udaipur at cheapest rates and best car rental service in udaipur.